Roller-skating isn’t about finding the right music, the right moves, or the right wheels. It’s about people. The Skate World staff doesn’t just count heads as they come through the door. We take the time to get to know families, kids, and teens in Lakeland. It’s important to us to provide a safe space for kids to have fun and stay active. That’s why we’re a part of Kids Skate Free. If don’t know about Kids Skate Free, you’re in for a treat. 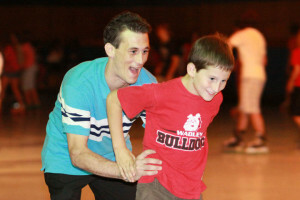 Kids Skate Free is a national organization that encourages wholesome fun and free activities for kids across the country. Participating skating centers offer free skating passes to kids under 12. Parents receive weekly emails with skate passes they can print out and bring to the rink. The program has done a world of good for families across the U.S. In fact, they’re just a few kids away from reaching half a million participants! In case you hadn’t noticed, Skate World loves giving away free stuff! We offer Kids Skate Free Passes all year long. When you register online, your preschool and elementary aged kids can skate for free at any of our weekly matinee skates or our weekly $2 Tuesday skate event. We’ll even let you use them at holiday skate events! Skate rentals are extra, so feel free to bring your own or invest in a pair at our summer roller-skate sale. Have a question about summer events for Lakeland kids? Call Skate World for information on summer skating, Christmas in July, and weekly skating coupons.